NEW - Clasp, lobster claw, satin-finished sterling silver and steel, 16x7.5mm double-ended infinity. Sold individually. NEW - Clasp, lobster claw, satin-finished sterling silver and steel, 11.5x7mm infinity. Sold individually. 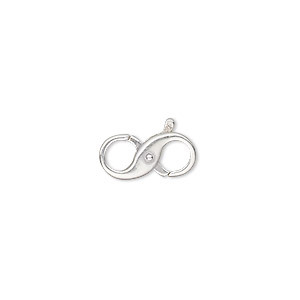 Clasp, lobster claw, sterling silver, 16x8mm with double-sided diamond-cut design and 6mm closed jump ring. Sold individually. Clasp, lobster claw, sterling silver, 14x5mm with double-sided diamond-cut design and 5mm closed jump ring. Sold individually. Clasp, lobster claw, sterling silver, 12x4mm with double-sided diamond-cut design and 5mm closed jump ring. Sold individually. Clasp, lobster claw, sterling silver, 10x4mm with double-sided diamond-cut design and 4mm closed jump ring. Sold individually. Clasp, lobster claw, satin-finished sterling silver, 16x8mm with 6mm closed jump ring. Sold individually. Clasp, lobster claw, satin-finished sterling silver, 14x5mm with 5mm closed jump ring. Sold individually. Clasp, lobster claw, satin-finished sterling silver, 12x4mm with 5mm closed jump ring. Sold individually. Clasp, lobster claw, satin-finished sterling silver, 10x4mm with 4mm closed jump ring. Sold individually. 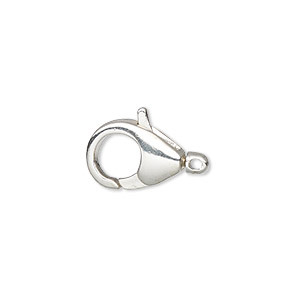 Clasp, lobster claw, sterling silver and steel, 12.5x9mm oval with swivel. Sold individually. Clasp, lobster claw, sterling silver and steel, 10.5x7mm oval with swivel. Sold individually. 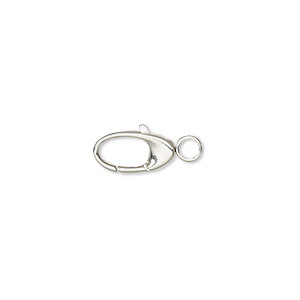 Clasp, lobster claw, sterling silver and steel, 8.5x6mm oval with swivel. Sold individually. 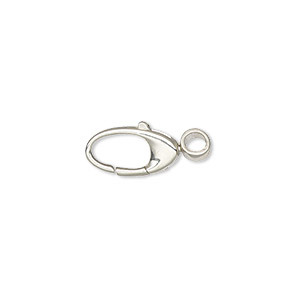 Clasp, lobster claw, sterling silver and steel, 12x6mm oval with swivel. Sold individually. 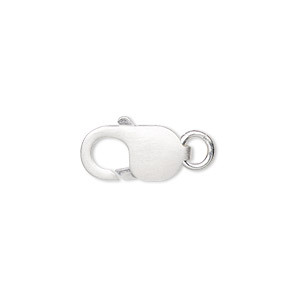 Clasp, lobster claw, sterling silver and steel, 10x5mm oval with swivel. Sold individually. Clasp, lobster claw, antiqued sterling silver, 13.5x8.5mm double-sided with etched heart design. Sold individually. Clasp, lobster claw, antiqued sterling silver, 13x8mm double-sided with etched cross design. Sold individually. Clasp, lobster claw, antiqued sterling silver, 12x7.5mm double-sided with etched swirl design. Sold individually. 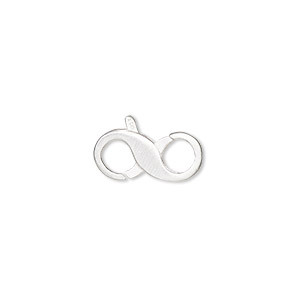 Clasp, sterling silver and steel, 15x10mm double-ended infinity. Sold individually. 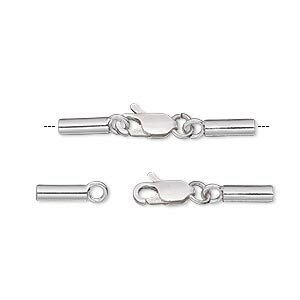 Clasp, lobster claw, sterling silver, 30x5mm with 9x5mm and 8x2.5mm glue-in cord ends, 2mm inside diameter. Sold per pkg of 10.